People looking to do some early Christmas shopping will get a chance to help good causes in the process as Seoul International Women’s Association is set to host its annual fundraising bazaar. Now in its 55th year, the SIWA and Diplomatic Community Bazzaar has been a mainstay of the local community in the build-up to the festive period, raising millions of won for charity each year. It’s traditionally been a place to pick up unusual gifts and traditional cards and decorations ahead of Christmas, particularly when such things were hard to find. There is still a lot of unusual crafts and goods from around the world, but more recently the bazaar has been a place to find out more about the community and try some authentic foods from one of the many stalls run by embassies or local expat businesses and organizations. “The annual bazaar brings SIWA, the diplomatic community and other expat organizations in collaboration to raise money to help the many disenfranchised members in our host country,” SIWA President Anne Choe said. All proceeds generated by SIWA from the event will be donated to the SIWA Welfare Fund, which contributes to over 20 Korean charities, with a focus on children, homeless or disabled individuals or senior citizens. 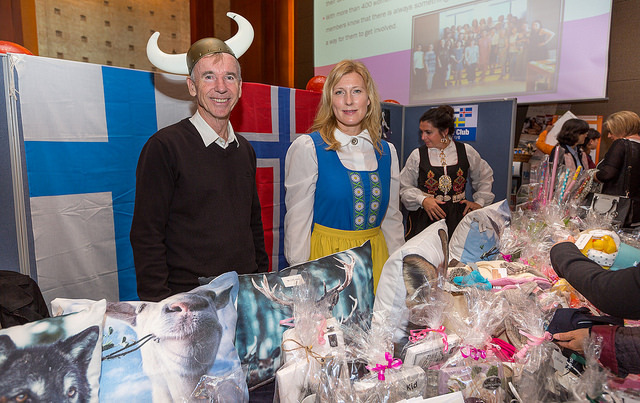 “The SIWA and Diplomatic Community Bazaar is absolutely the best event to take part in to share diverse cultural experiences and discover wonderful international products, and also a great opportunity to participate in helping charities,” SIWA Special Events Chair Jen Chae said. The bazaar will charge for admission this year, with the 5,000 won entry fee going to the SIWA Welfare Fund. One raffle ticket is included in the price of entry. Stage performances will run throughout the event, including music from violinist Mia Jun, ranging from classical to jazz, as well as a raffle. The bazaar runs from 10 a.m. to 2 p.m. on Nov. 13 at Lotte Hotel in central Seoul. For more information on SIWA, the Welfare Fund or the bazaar, please visit www.siwakorea.com.